It was a very hot sunny day. I almost got dehydrated due to lack of water. I stopped by at a local kiosk inside the main entrance gate of Amer Fort, Jaipur and purchased a nice cold bottle of mineral water to rejuvenate myself. While I was heading back from the fort, I came across this staircase. I got particularly impressed by the "Jugaad" or the alternative stop-gap arrangement made for water, by a villager to carry and keep it away from heat. He probably filled the plastic bag with water on his way up to the fort, from a local roadside water tap. Since the heat was fierce, he cleverly hung the bag on the side rail of the staircase. The staircase was under shade, and that helped the villager bring down the temperature of the water by a few degrees. Hats-off to him and his idea. Well, It happens only in India, we have an alternative solution for almost everything. A word on the Composition. 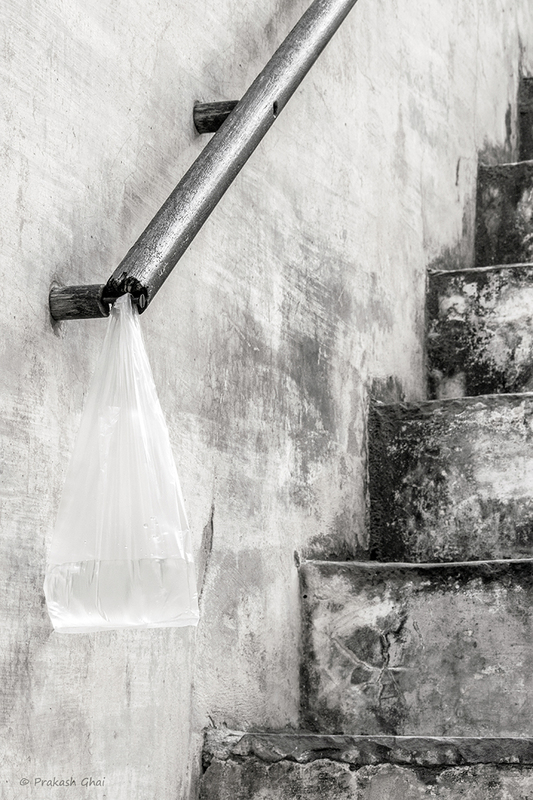 The photo falls under the Minimalism Category: Minimalism as Less Elements, with only tow elements in the image, i.e the staircase and the plastic bag. I focused on the plastic bag and used the geometry available to add interest to the composition. Shooting vertical was intentional, so as to show the ascending staircase disappear on its way up and and to leave a little room for imagination. Great idea by the villager and also a well taken pic. Thank you :), yes Maybe !